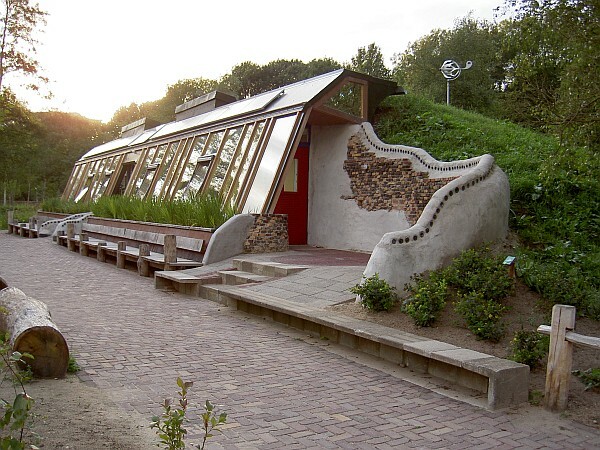 An ‘earthship‘ is a type of house that exists on the delicious, lunatic-fringe end of the green building world. 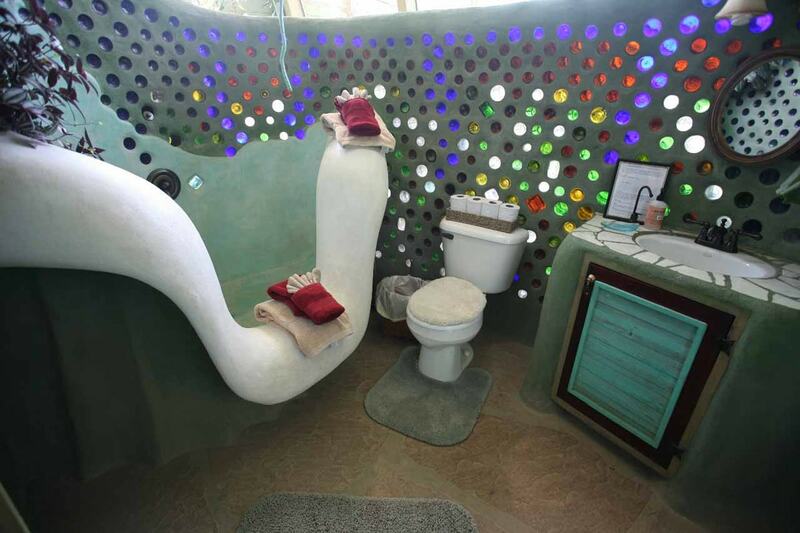 Earthships in Australia are quite rare; the original prototypes built by Michael Reynolds are in New Mexico, USA. They are heavy stone-clad tyre structures with greenhouse-style walls facing towards the sun. The back rooms, built into hillsides are so heavily insulated they are like caves with skylights. The unusual stylistic elements of curved glass bottle walls, brightly painted surfaces and niches built into the thick walls are unlike any architectural style and seem to hark back to our bead-collecting, feather-adorning prehistoric days. But nevertheless, these buildings are strangely appealing. The stubborn architect and his quest to build structures that are so out of the ordinary that they are built from materials that are essentially garbage has made his achievements remarkable. In fact, it is (for all intents and purposes) illegal to build “true” earthships in Australia because the sewage is treated and recycled within the walls of the building. Something that is very unlikely to be approved by even the greenest town councils. Earthships or earthship-inspired structures are ideal for people who are interested in pushing their home towards the edge of the established environmental repertoire. They minimise the amount of synthetic building materials required (and maximise the amount of re-used materials) whilst still keeping strict control over the internal temperatures. One of the greatest advantages of the tyre (or hay bale) house is its ease of assembly. The tyres themselves are very affordable and can be piled up in any configuration, straight or curved. The Earthship (or any tyre or hay bale construction method) allows for fantastically sculptural, curved walls. This has developed into its own bizarre architectural language. We believe that there is a way this style could be pared back to a more ‘wearable’ style for regular homes. There have been three prototype Earthships in Australia that we are aware of. One in Apollo Bay, VIC, another in Northern NSW and a third near the University of South Australia (constructed as part of their Masters of Sustainable Design program) however, to avoid permit issues none of these structures are classed as residences. Earth-rammed tyre “brick” load bearing walls – as with hay bale construction, there are issues with getting these structures approved as load bearing and often it is required that some kind of timber or steel structure actually supports the roof and the tyres/hay bales are simply infill. Recycled aluminium cans and glass bottles as partition walls – although these do not have to be engineered, the construction method is unorthodox. Blackwater treatment via solar septic tank, filters and plants as well as treated greywater within the building for toilet flushing – doing anything with blackwater (sewage) is difficult to get approved, having the processes occurring within the walls of the house is close to impossible. The unusual appearance of the structures may have approval problems in urban areas if neighbours object. According to the Earthships in Australia Facebook Group; “Pockets of (legislative) Freedom” seem to exist where these rules are less likely to be an issue. The most significant of these are in South Australia (but not within 100km of the coast – for example Woomera, Roxby Downs and Coober Pedy) some of inland Western Australia (near the Gibson Desert Nature Reserve) and some of inland (Unincorporated) Western New South Wales and Western Victoria (specifically Broken Hill, Wilcannia and Mildura). All of these areas are more remote and the Earthship prototype is very suitable for these kinds of conditions. The Earthship has its own water supply and waste system. It treats waste water within the walls of the building so that it can be re-used for irrigation and toilet flushing, thereby minimising water consumption in these desert environments. The earthship also usually includes a greenhouse section incorporated into the open plan living areas of the house for the production of food and extra warmth in winter. The energy of the house is off-the-grid, generated by solar power which also suits it to remote areas. Because of the overwhelmingly thick walls and many of the houses are built into hillsides the thermal properties are also exceptional. These dwellings are very bushfire resistant due to the rammed earth construction and do not require a lot of maintenance because they are so robust. Because the Earthship prototype was developed in the deserts of New Mexico, USA, the design is similarly suited for the climates of remote Australia (but also some urban areas like Canberra). There are many really interesting elements of these structures (the use of unusual materials, incorporation of greenhouse into living area, re-use of water etc) that can be utilised in more conventional home designs in order to move them towards a more carbon-friendly design. It would be legislatively difficult to build a true earthship in Australia, but all it really takes is for one pioneer to guide the first council through the approval process and set the precedent.